I was reading Paul Berry's latest post on his excellent Devon Geography blog, and he described visiting the grave of my Great Grandfather having read my blog post on the map project for the Armistice that I am doing at my school. 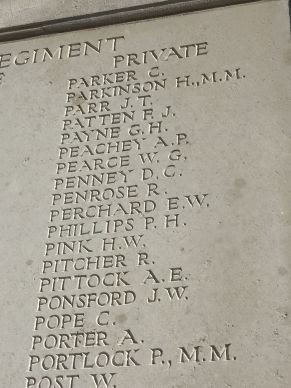 I was touched that on his visit to Tyne Cot, he took time to seek out the panel and take an image of the mention for Harrison Parkinson, who was awarded the Military Medal for bravery in no-mans Land. Thanks Paul!